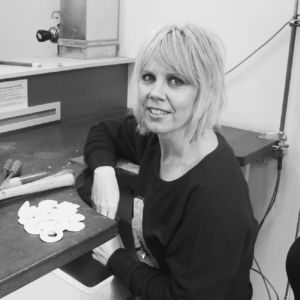 Julie Holmes is a jewellery designer and maker. Tribal and ancient cultures and their customs are the main influence of her work. Every single piece is unique and handmade. Textures, patterns and markings on metal and clay are handcrafted by Julie with imperfections celebrated. An emphasis of showing the makers hand is an integral part of Julie’s work. Natural fibres such as linen, cotton and paper yarns bound by hand give her work a natural and individual quality. Julie’s work is stocked in Fremantle Arts Centre shop FOUND.